Hi! I love your site! I too love the GSD and here is my girl, Bella Von Hastings. She is 8 months old, and extremely ornery!! She is a bit of a bully to our other dog, Reggie who is a Sheltie. She is bossy, mouthy, loves to play and nibble on you here and there! She absolutely loves her ball and goes crazy when she doesn’t have it with her! She turns to butter when you touch her chest. If you scratch her anywhere underneath her, she falls and is completely submissive! She will be going to school soon, and get properly trained. 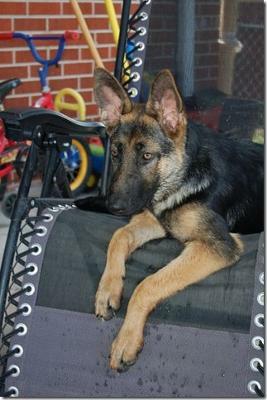 I grew up with GSD’s all my life and I just adore them.This is her in my chair that she took over! I am glad I have my baby girl, Bella! Bella is a Beautiful GSD and her name fits her to a "t". Look at that face, who could resist that? Big ears, big nose, big feet,and sparkling eyes - beautiful! She sounds like my Mia which she be 2 years old on 11/10, bossy, mouthy, likes to nibble, balls any size, any kind and momma's socks. She will grow to be a protector, it's in their blood. Take care of your a girl and she will take care of you!!! We our story total german shepherd puppy mia story and mia my beautiful gsd. Thanks.